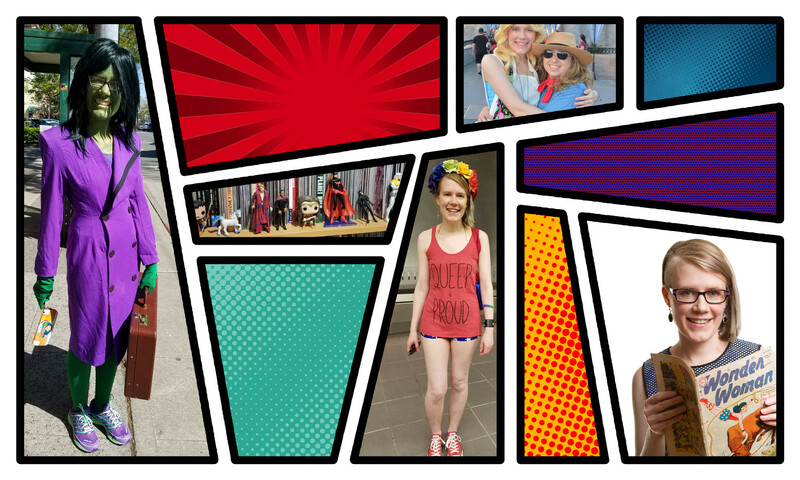 I know, my blog’s been getting neglected as of late. Blame it on GeekGirlCon, or more importantly, donate to help us raise funds in order to secure our venue. We’re 50% of the way there. Anyway, in the next couple of days, I’m going to be doing some best of 2010 posts. I should start with the big disclaimer that these are comics I reviewed in 2010. They may have been published earlier than 2010, but I published my review of them in 2010. Air came highly recommended from several friends, and it held true to its hype. 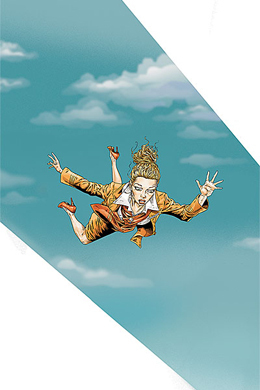 On the back cover, there’s a quote by comic author Jason Aaron saying Air is a “post-9/11 fairy tale, part Gabriel Garcia Marquez, part Lost.” Which I think is the best summation of the adventures of Blythe, the somewhat odd flight attendant with a panic attack-inducing fear of heights. Apparently, the Clearfleet employment recruiter gave her a good talk. Blythe meets a strange man calling himself Javad/Niko/Manuel, and in the post-9/11 atmosphere, she assumes he’s a terrorist. In fact, when she stalls Javad, her friend and follow attendant Fletcher even questions her ethic profiling. Madame Xanadu is just an awesome tale that spans centuries. Thanks to the staff at Dreamstrands Comics for recommending the series to me. You were right; I did love it. Madame Xanadu starts off as the young Nimue Inwudu in the world of Camelot. She is the sister of Morgana le Fey and Vivienne, the Lady of the Lake, and they are descendants of the elder folk, each on having magical powers. Nimue is particularly connect to the earth. 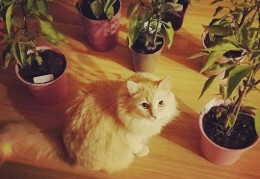 She’s able to foresee the future by using nature. Nimue is also the lover of Merlin. 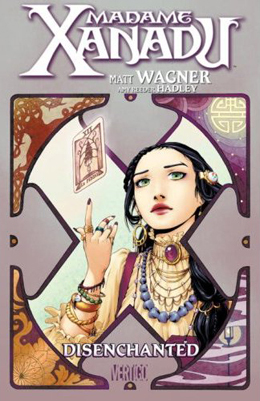 Read my entire review and buy Madame Xanadu: Disenchanted by Matt Wagner and Amy Reeder Hadley. Atomic Robo and the Fightin’ Scientists of Tesladyne is perhaps one of the most brilliant comics I’ve read in a while. Love it little pieces: the humor, the mixing of genres, Robo’s solution to everything being blowing it up. It just works so well. I love the care and detail put into designing Atomic Robo. He doesn’t look like other robots. I don’t think Cybermen, Data, or Cylons. 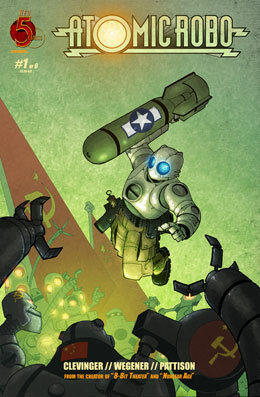 I think Atomic Robo, the wacky fighting scientist who’s pretty indestructible. This story is smart in how it frames Robo’s first battle against Dr. Helsingard and how he becomes Robo’s nemesis. Actually, I like that it was by accident. I like Helsingard being the obsessive one and swearing revenge on Robo, but Robo not really caring. He’s almost taking down Helsingard’s evil plans by accident. Read my entire review and buy Atomic Robo: Atomic Robo and the Fightin’ Scientists of Tesladyne by Brian Clevinger and Scott Wegener . Persepolis by Marjane Satrapi is very engaging. I sat down and read the memoir in a couple days; I couldn’t put it down. Satrapi’s story isn’t just that of a young girl growing up in Iran, but also a historical viewpoint on the Iranian Revolution in 1979. Satrapi’s art fits perfectly with the story. It reflects the youth in the story, and the stark black inking works well with the dourness of Marji and her family’s story. But at times, Satrapi’s illustrations are masterful with showing the warmth and love that Majri and her family have for one another. 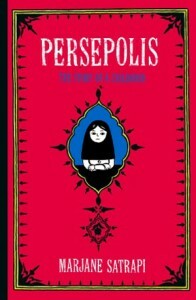 Read my entire review and buy Persepolis: The Story of a Childhood by Marjane Satrapi . This is the perfect story for the reader interested in comic books/graphic novels, but doesn’t know where to jump in as Batwoman: Elegy is a self-contained tale. I’d also recommend it for fans of art, crime and mystery stories, military family tales, LGBT narratives, superheros, and anyone who wants to challenge my assertion that Batwoman makes a better Batman than Bruce Wayne. 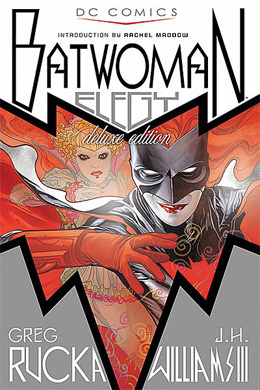 Read the original review on Ink-Stained Amazon and buy Batwoman: Elegy by Greg Rucka and J.H. Williams III.